The spring fashion shows are over and all the attendant hoopla that goes with the territory. Running from the tents to the “lounges” and the off-site shows is no picnic but a fashionistas work is never done. I’m not going to bother you with my thoughts on the major designers since their collections were all over the papers, websites and blogs and you’ve probably formed your own opinions by now. Instead I want to focus on some of the names you might not be familiar with, not to mention some of the interesting brands I checked out at the various lounges set up in the Empire Hotel during that week. It was a blast from the past at MARIMEKKO’s runway show. Not only were the familiar bold and brilliant prints back, the models included some of the past decades most celebrated names, including Carmen and Carol Alt, which just goes to prove that Marimekko’s clothes work on all ages. I especially loved the black and white separates, the sophisticated v-back shift dresses and a most surprisingly, a simple double breasted pea jacket in solid navy. Printed Converse sneaks added a cute touch to the outfits. VIVIENNE TAM’s press release stated that the “inspiration for spring is based on the five elements of Chinese cosmology –metal, wood, water, fire and earth.” Whatever! Personally I got a strong Bauhaus vibe from the collection. Bold, graphic patterns in some cases combining triangles with circles or waves with squares added up to a strikingly modern whole. I felt like I was stepping into a 1920’s Tamara Lempicka painting. Outstanding was Tam’s black cotton hexagonal cutwork dress, the silver printed cotton denim trench and the black patent leather shell with triangle print pants. Adding to collection was her new jewelry collaboration with TSL Jewellery. Standout pieces included her yellow gold hexagonal necklace, a gold and jade necklace and the black gold earrings. TIA CIBANI, formerly the creative director at Ports 1961 debuted her capsule spring collection in an informal setting. To here her tell it the collection was based on a dreamy, modern fantasy with an emphasis on structure and draping. Fabrics were a standout. 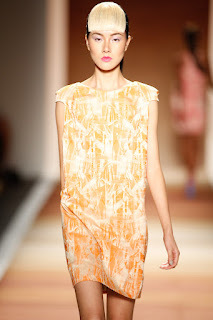 I loved the fluid ombre printed chiffon, double faced wools, silk lames and linen/cotton blends. While not for every one the collection will appeal to the woman who has a strong sense of self and a unique way of dressing. 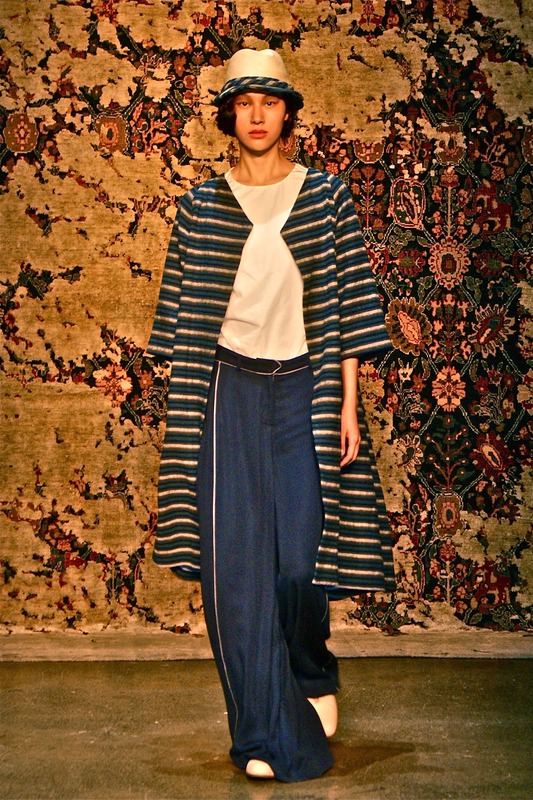 Highlighted for me was Cibani’s navy blanket stripe kimono sleeve trapeze coat layered over white poplin shell with navy silk faille wide leg trousers. Tia Cibani's Coat is a C&C Classic! Models were placed in various vignettes at the (heavily attended) VERONICA BEARD presentation. The free flowing wine made my passage through the crowds bearable and the classic free spirited American sportswear vibe throughout made for an enjoyable experience. Her jackets really made an impression, especially the umber naked lambskin motorway piece and a lovely washed celadon linen convertible jacket. The latter looked cool over a tile print tunic and pleated shorts. While there was no booze, only Coconut water at WHIT’s tropical island themed presentation, the clothes more than made up for the lack of rum drinks. Easy, breezy cool clothes will appeal equally to the downtown girl as well as the uptown preppy. There were stripes, batiks and campy prints galore but for my money I’d opt for the navy bandeau top with peplum batik skirt or any one of Whit’s striped separates. And no, I’m not too old to wear these so just cool it! C&C Calls it: Bandeau is Back, and Front! Cesar Galindo hit a home run with the debut of his CZAR collection. I was impressed with the easy, fluid shapes, the gorgeous color palette and the total wearability. I drooled over the tangerine stretch viscose sculpted cap sleeve dress, the persimmon matte jersey draped tank over copper sequin pants and the fabulous chartreuse silk capelet dress. While the show could have used a little editing, on the whole this collection was a winner so keep on the lookout for where the collection will turn up next spring. CZAR - Anastasia Would Approve! Possibly my favorite show of all was RUFFIAN. The two Brooklyn-based designers offered an homage to their borough with a tongue-in-chic riff on the classic toile print within the context of Williamsburg, their neighborhood. This was a perfect balance of baroque with hipster. Looking especially great was a blue/white cotton ticking stripe coat, cotton lawn shirt and sheer leggings in the Williamsburg toile print silk georgette. Also totally cool, the bow blouse in yellow toile silk georgette, under painter overalls in ivory metallic silk. Basically. I want to own everything! Have to admit that I was underwhelmed by ANNA SUI this spring. Her collection reminded me a bit too much of Betsey Johnson’s girly-girls with a bit of punk, biker chick and grunge thrown in. A bit too trailer trash for me. However there was one outfit that I liked and it featured a coral/cream tweed jacket over a pretty coral mixed print dress. Better luck next season, I know you’re very talented. Now on to the good stuff. As you know, every season there are press lounges hosted by PR and special event firms and magazines at the Empire Hotel and the Mandarin Oriental. Editors have a chance to unwind over snacks, coffee wine etc. while getting a manicure, mini facial and massage. Kind of hard to beat this pampering and I’m certainly not one to pass up an opportunity to indulge in any beauty treatments. And speaking of beauty, HARD CANDY gifted the press with some of the brand’s best selling cosmetic items. No time for a manicure? Try imPRESS press-on nails by BROADWAY NAILS. Tried the product and the results were professional looking with no messy drying time or chipping. C&C Pampering: Hard Candy and Broadway Nails! All of the above brands were displayed at the GBK Lounge. In addition there were some standout accessory and rtw lines. 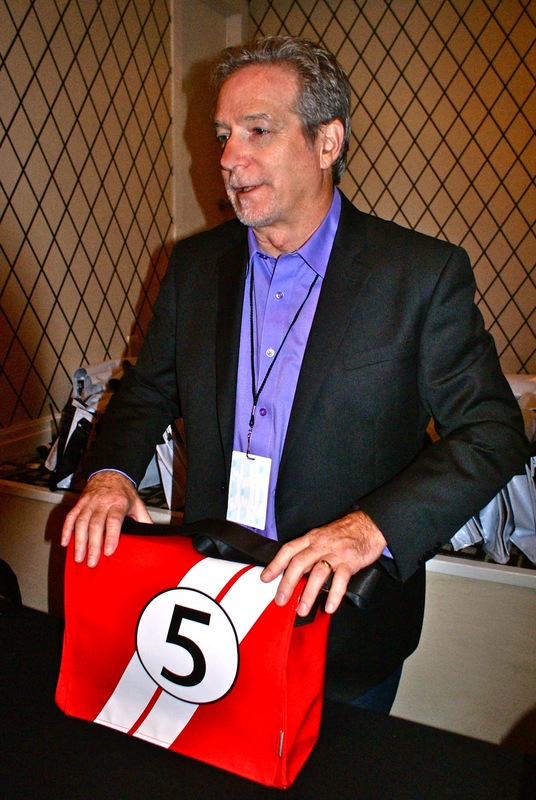 My top picks were G WEAR, a fashion company that’s committed to recycling while providing a quality product. I selected a terrific hand sewn 100% cotton tee with cute fashion figure appliqué on the back. The line takes the classic tee to a whole other level. BLINKZGEAR (Try saying that fast), offered cool urban messenger bags with graphic designed zip out front covers. I guarantee that you can stuff a week’s worth of s—t in each one and still have room to spare. GBK Lounge - C&C's Top Picks of the Up and Comers! My next stop was the Daily Style Sessions Lounge (Suite) atop the Empire Hotel. Snacks, a personalized tote and drinks were the order of the day but I must give a shout out to the OASIS DAY SPA’s massage therapist, Angela Loften who poked and pummeled my body into a state of nirvana. Run, don’t walk to one of their locations for the best massage of your life! HANES gave editors a fabulous pair of Blackout Convert-a-tights that offer two looks in one by converting tights into leggings. Pretty nifty idea! 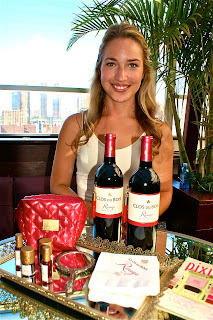 PIXI cosmetics introduced us to the Clos du Bois Rouge Cosmetique line of red wine inspired cosmetics. I’ve already sampled the nail polish and liquid blusher and have become a fan. Clos du Bois - Red, Red Wine for Red, Red Nails! 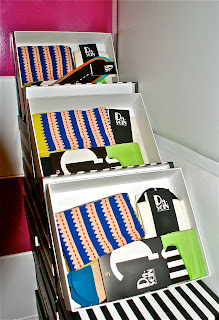 Daily Style's Personalized Totes - C&C Approved Swag Containment System! At the Allure lounge I zeroed in on the cheeky socks from DA-SEIN. As the press release stated the brand’s aim is not to reinvent socks but to challenge preconceived opinions about how to make a great pair the center of attention. On of my all time fave skin care brands is SKINMEDICA. While I’ll never have that English rose porcelain complexion, using this company’s cleansing, toning and moisturizing products goes a long way towards making me look human. I can’t wait to try the latest offerings that I scooped up during fashion week. SkinMedica Keeps C&C Looking At Her Best Second "C"
There were other interesting happenings going on at the Empire Hotel. First there was the CYGALLE Healing Spa event and another great massage plus some very healthy juice drinks and giftys. 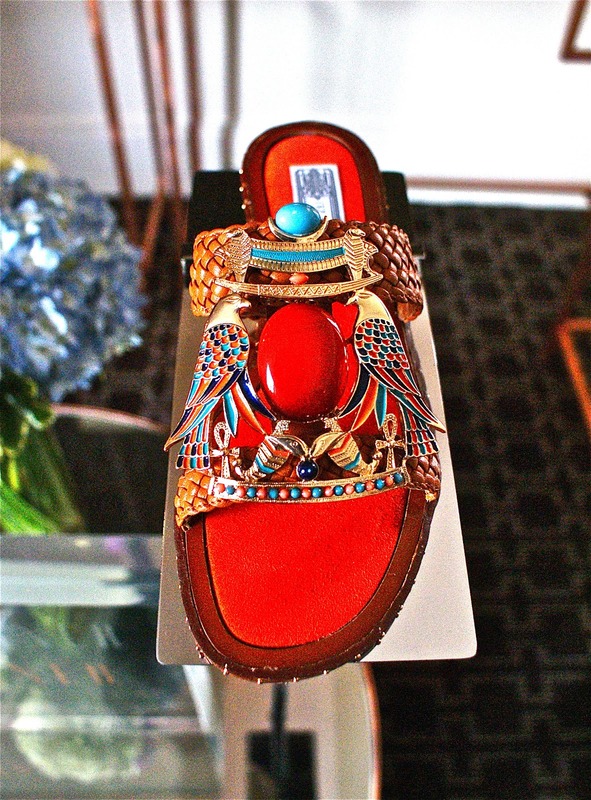 For this dedicated shoe maven there was IVY KIRZHNER and her brand new affordably priced collection. My top pick for next summer (or a mid winter cruise, ha) has to be the Egyptian inspired sandals with intricate enamel embellishment. Simply gorgeous as was the rest of the very fashion forward collection. GOTHAM SKINCARE offered a terrific three-day event during fashion week and it was worth the trek to 346 West 57th Street to this new spa where I was offered a choice of treatments. I opted for a beta hydroxy facial peel that resulted in baby soft skin. Definitely checkout this spa. The service was attentive and the offerings top notch. So I ended the week all buffed and polished and loaded down with goody bags (yes we all want them, so cool it) that will take me weeks to go through, especially the cosmetics but I’ll keep you posted if I love the results. I can’t end this blog without giving a shout out to the ACADEMY of ART UNIVERSITY’s graduate fashion show. I was floored by the professionalism and beauty of the various collections. I loved Tanja Milutinovic’s ladylike chic approach, the beautiful tailoring produced by Stephina Touch, the chic attitude apparent in Iglika Vasileva Matthews designs, and Yanfei Fan’s simply terrific collection. Overall, the future looks bright for fashion if these young designers are anything to go by. These are the names to keep an eye on. That’s all for now, talk to you soon, C&C.